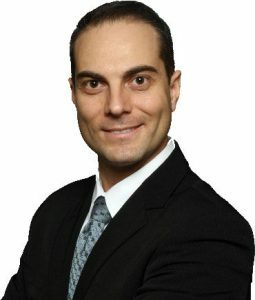 Maple, ON – In his new book, Back to Health by Choice: How to Relieve Pain, Conquer Stress, and Supercharge Your Health the Chiropractic Way, Dr. Walter Salubro discusses how your health is in your hands with the choices you make. It starts with a choice, says Dr. Walter. It’s when you make that choice for health, that choice for healing, that the answers that are specific and suitable for you will show up. “Chiropractic has helped many people with all sorts of health problems, ranging from back pain, neck pain, headaches, migraines, arm pain, leg pain, sciatica, and much, much more. But there is a fundamental difference between that person who makes a choice for healing and who starts chiropractic care and that person who doesn’t make a choice for healing and therefore doesn’t start chiropractic care. The person who starts chiropractic care gets well and regains their health because they made that initial choice for healing. If you are in sick, suffering, in pain, or stress-out, Back to Health by Choice will inspire you to make that choice for healing and discover chiropractic so you too can experience a transformation in your health and in you life. Read it and transform your health. 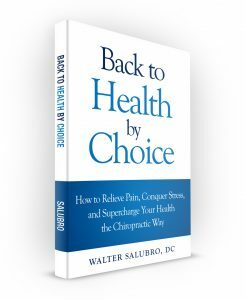 To celebrate the launch of his new book, Back to Health by Choice, Dr. Walter Salubro will be hosting a Book Launch and Seminar Event on August 29, 2015 at 10:00am at his clinic in Maple, Ontario. Dr. Walter will be presenting his signature seminar, Back to Health Makeover and he will give be giving a free copy of his book to those who attend (one copy per family). To register for this free event, call (905) 303-1009. Space is limited to 23 people.